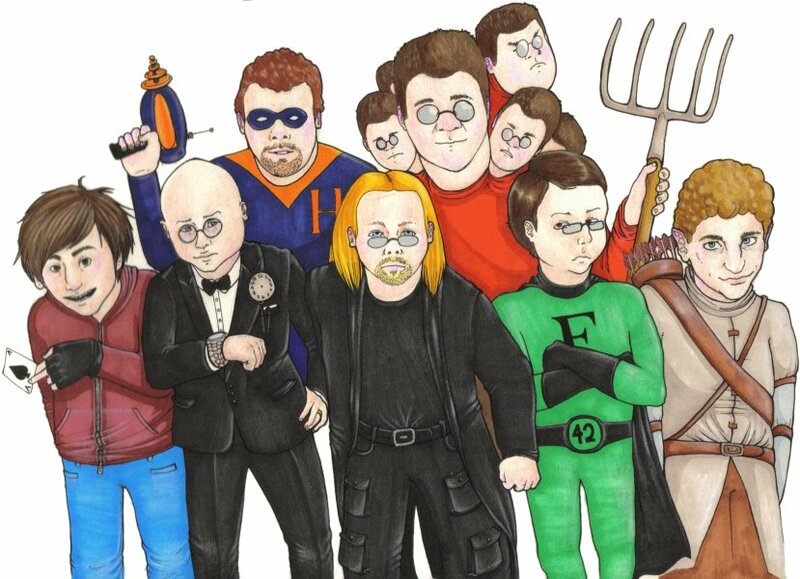 Clockwise, from center: David ”Uncle Dave” Smith, JD ”Timeshredder” DeLuzio, Alexander ”AceCaseOR” Case, Hitch, theangrymob, Matthew ”Eldhrin” Walton, and W. Blaine ”Fiziko” Dowler. Illustration by S. Henderson. Alexander “AceCaseOR” Case: When I’m not writing for Bureau42, I’m either blogging about non-genre related stuff at countzeroor.wordpress.com or playing video games. Or… you know, working at my paying job – when I have a paying job. Matthew “Eldhrin” Walton: When people find out what I do for a living, they often ask me for help fixing their computer. I find that quite amusing, because I’m one of the people who break them in the first place. Yes, I’m a computer programmer, but I do other things. Here’s a non-exhaustive list: nitpicking popular entertainment, playing recorder, trying to play the lute, singing, playing the Tenori-on, playing Champions Online, reading, playing Godlike, playing Serenity, writing, contributing to the design and development of Perl 6, cooking, stroking the cat and going to aikido classes. I like to dispell ignorance (also known as ‘teaching’) and will get very long-winded about any topic I know about with only minor provocation. I live in Nottingham in the United Kingdom, and would like to be able to afford to live somewhere which has air. W. Blaine “Fiziko” Dowler:: As you can probably tell, I have no formal training in any sort of critiquing or professional writing. (My first two degrees are in physics, and my third in Education.) I’ve been a TV and movie junkie for most of my life, so I signed up for this when Dave put out a call for volunteers. My day job is in supplemental education, so my productivity here will drop every time report cards hit. I can also be found on Facebook, and I’m fiziko.b42 on Skype. If you add me in either place, let me know you’re a Bureau 42 reader in the original message. Brian Rollins (TheAngryMob): Brian’s a Star Trek nut and all around geek living in the Denver area where he works as a Web Developer. He’s worked for various companies from Travel to Aerospace. He’s currently trying to educate his younglings on the ways of geekdom and the joys therein. When he’s not here talking geekery, he’s recording audiobooks, podcasts, and video game voices. You can hit him up at TheVoicesInMyHead.com or VoicesOfBrian on Twitter. JD “Timeshredder” DeLuzio: JD DeLuzio, occasionally known as a Timeshredder, has one published novel and numerous reviews and articles. He lives somewhere in Canada and sometimes serves as an obscure panelist at SF conventions and literary events. Doubtless my work-in-progress will win me fame and fortune; I would, however, be willing to settle for mere fortune. David E. Smith: David is a computer systems engineer at a major research university, which explains why he’s had so little time to work on the site he founded in 2000, in the last, oh five or six years. Feel free to look him up if you’re so inclined.